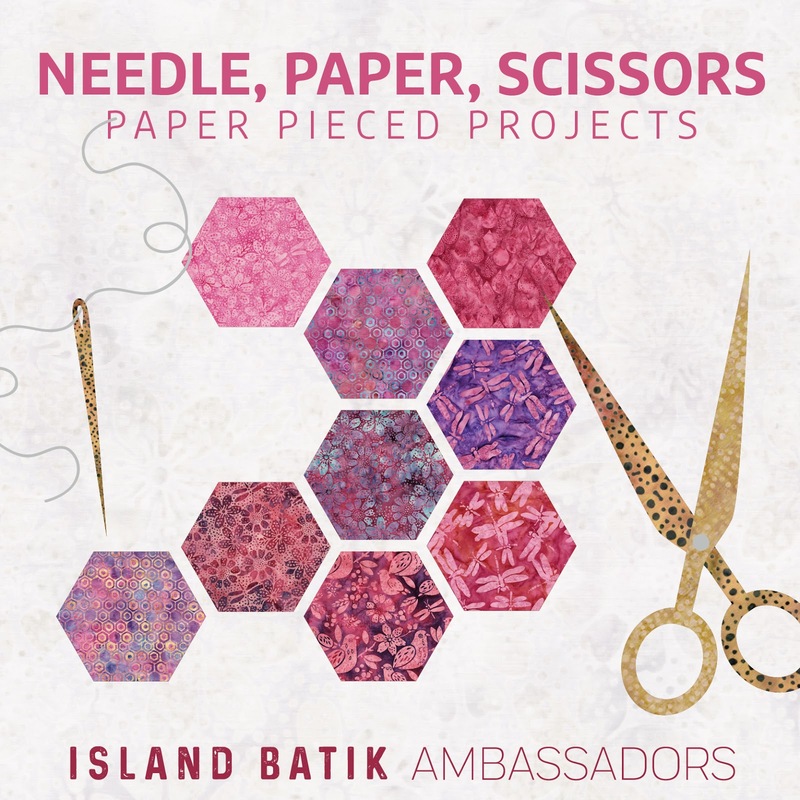 To clarify, there is foundation paper piecing and English paper piecing (or EPP). Either one was fine for this challenge. 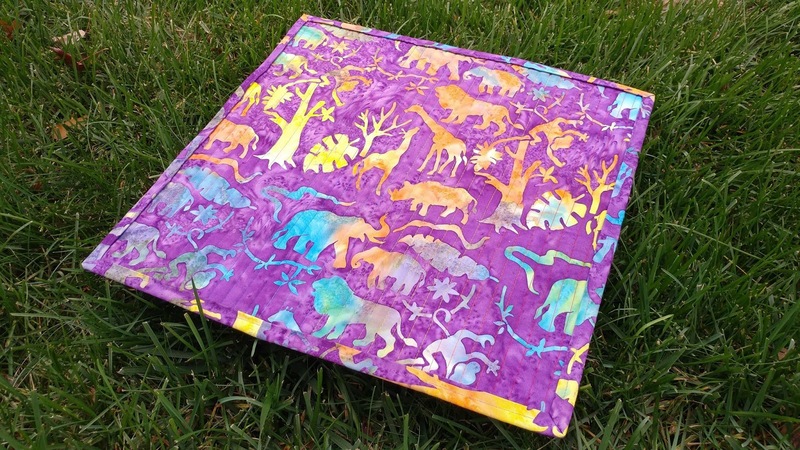 Foundation paper piecing is used with a sewing machine and allows for very precise sewing. EPP refers to hand sewing fabric around shapes or templates. I love foundation paper piecing, but it does require more time than traditional piecing. Given my limited sewing time after baby, I went with my EPP hexies that I had already started. First, I took inventory of the hexies I had already made and decided on a plan. 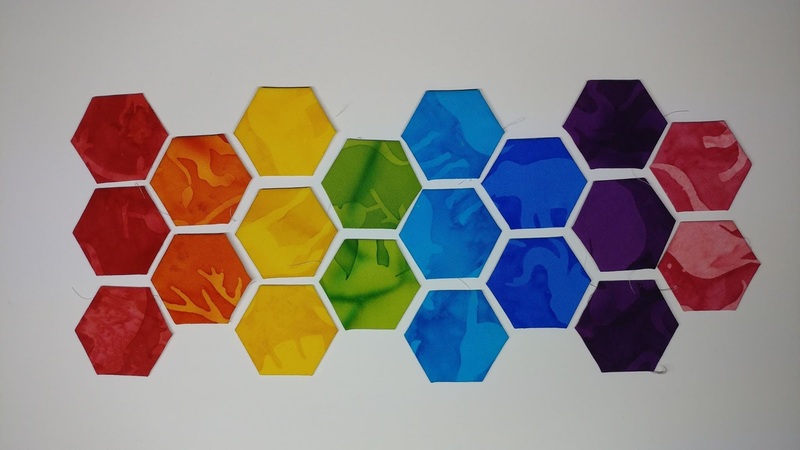 I already had 13 hexies made, but wanted 7 more to complete the rainbow design I had in mind. 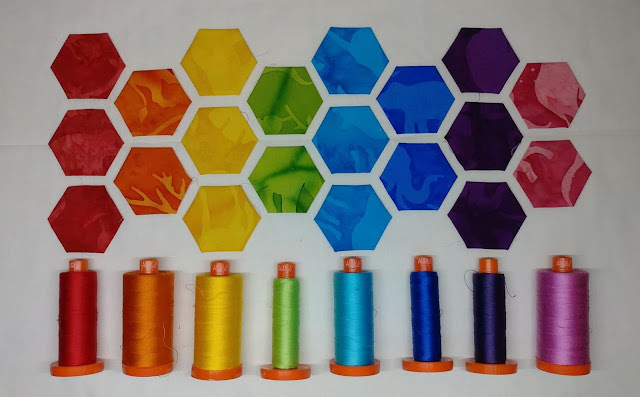 I like to thread baste the hexies onto a cardstock template. The technique I use is the same as Modern Handcraft's tutorial here. 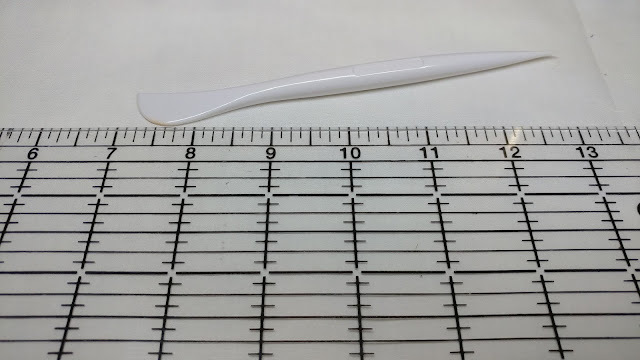 Some people baste through the paper template and some people glue the fabric to the template. 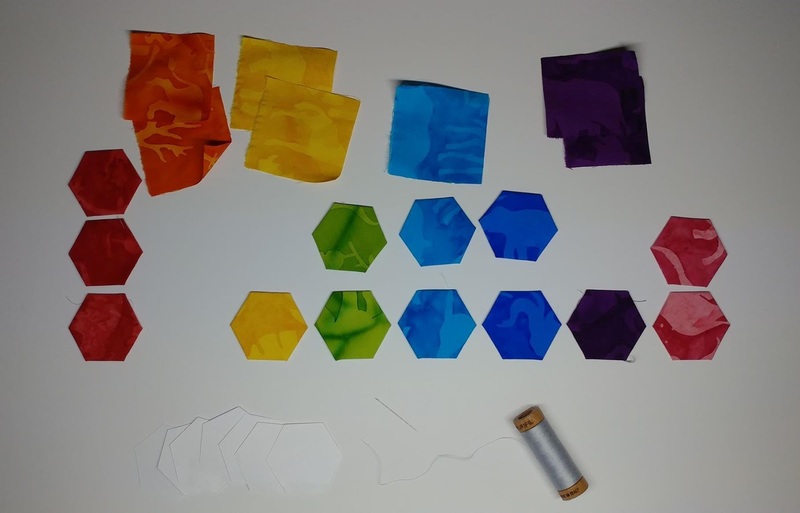 If you want to try making hexies, I encourage you to try several techniques and pick the one you like the best! I used cardstock hexies that I cut on my Cricut (I have the Explore Air, but definitely recommend the Maker if you plan to cut fabric) and Aurifil 80wt thread. Once I made enough hexies, I carefully took the cardstock out. For my mini quilt, I cut an 18" square of backing fabric (I used this one), Warm & Natural batting, and an 18" square of solid white fabric (this one). After layering them on my cutting table, I used my Hera marker to mark lines across the middle both vertically and horizontally. 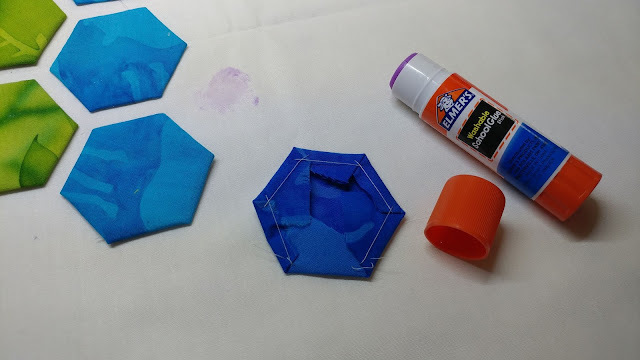 Using the lines as a guide, I arranged the hexies and used a glue stick to glue each one in place. I left about 1/4" spacing between the hexies. Traditional hexies are hand sewn together. Leaving them spaced apart and quilting over them to hold them down is referred to as "modern hexies." My newly organized Aurifil thread stash made picking out coordinating colors a snap! The only color that didn't match really well was the pink, but it was good enough for me! 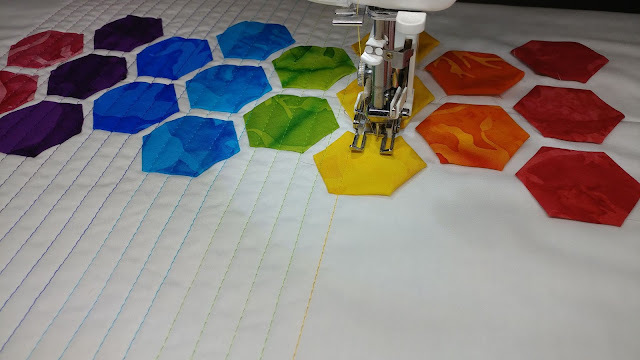 I used my walking foot to quilt four vertical lines of each color over the matching hexies. I just used the left side of the walking foot to space the lines apart. 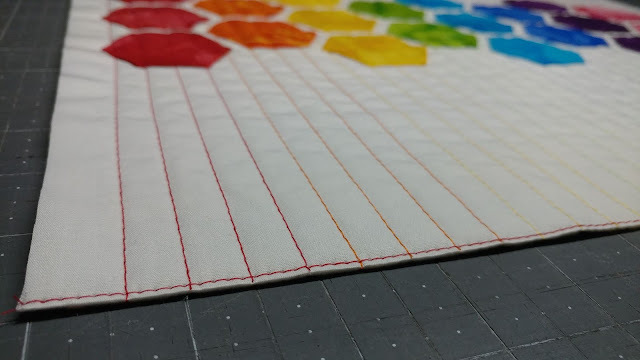 For my hexie projects I've done before, I have stitched corner to corner on the hexies (like on this table runner), but I wanted to emphasize the rainbow colors this time, so did the vertical lines. I was able to trim the quilt to 16" square. Before cutting horizontally, I marked the cutting line with my Hera marker, then stitched just inside that marking to hold the ends of the stitches in place. I finished by machine stitching the binding on (I used the same fabric as the back). I love how bright the colors are - perfect for brightening up these fall days! Do you remember when I used this Petting Zoo print to alter my MO Star Academy shirt to be a maternity shirt?? Now I'm snuggling that baby as I write this blog post! 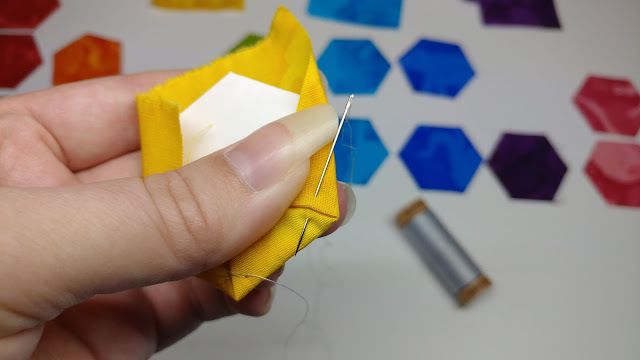 I like to keep a small zipper pouch of hexies with me when I'm on the go to have something to make if I have a bit of time waiting. Usually I don't have a project in mind. I just like to have something to keep my hands busy. 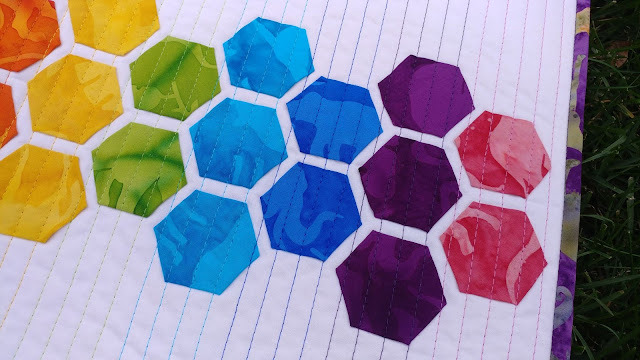 Do you make hexies or do slow stitching? No slow stitching here if I can help it!! 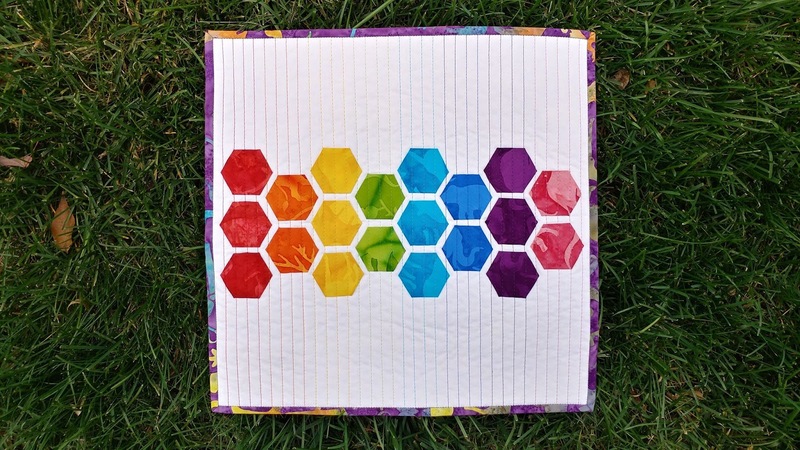 Love the way you quilted it with threads that matched the hexies!!! 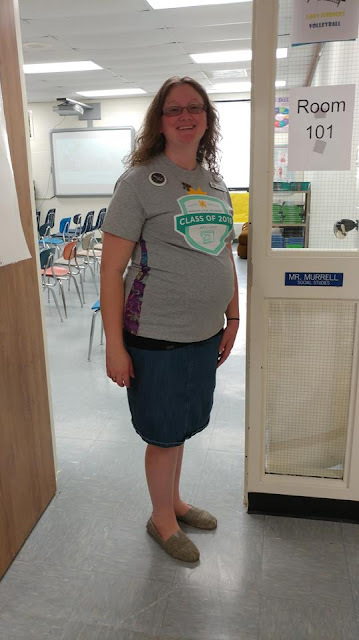 I love your rainbow mini, Laura!!! The rainbow quilting is the icing on the quilt!!! Great use of the hexies and I like that you took the time to color match the thread to the hexies! 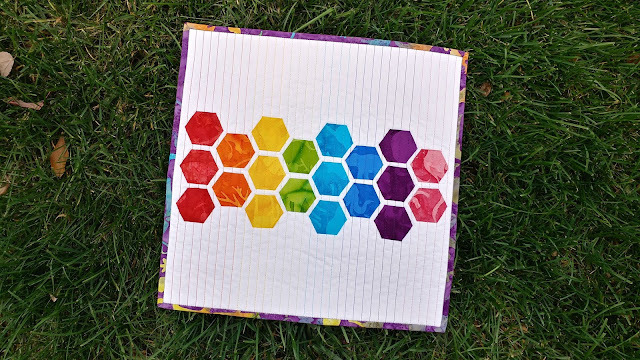 Love your hexie project! I started with basting them, but have now been won over by the wonders of glue basting. I do have to work not to use too much glue, though. I like to have hexies or another hand stitching project going for times when I don't have access to the sewing machine.